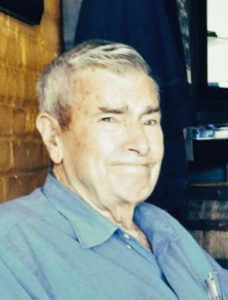 Friday, May 18, 2018 ~ 11:00 a.m.
John Finley Starns, 88, of Ashland, NE, died Wednesday, May 9, 2018 at his home in Ashland, NE, surrounded by his family. He was born October 28, 1929 in Omaha, NE to Harland, DDS and Lillian (Stanley) Starns. John graduated from Ashland High School in 1947. He served his country in the U.S. Air Force where he served as an Air Crew Chief on a F51 Fighter (Mustang) until he was honorably discharged in 1952. John served in the Korean War from 1951-1952 with the Air National Guard alongside his brother Del and other friends/cousins from Ashland. John was a lifelong farmer with his brother and together they owned and operated Starns Brothers, Inc. When John was 16 years old he and Del began farming an 80 acre piece of land in Ashland and their dad bought them their first Ford tractor. The farm still operates today with cattle and crops run by his nephew John, and is successful because of the vision and work ethic John had at a very early age. John’s true passion was flying, he began taking lessons at age 16 and after the service he bought his first airplane. His entire life he spent hours building his planes and his true enjoyment was his 4 seat red and white Cessna which he flew for years. Later, he built his most prized possession his yellow Piper Cub. This two seat beauty could be seen on a beautiful sunny day in the skies of Ashland. John spent many years at the Weeping Water Airport with his pilot friends, attending fly-ins, and smoking a good cigar. John flew his piper cub for the last time in September of 2017. A few of his other hobbies included driving his beloved Model A, taking his grandkids for rides on the golf cart and visiting the cows, planting trees, and caring for any animal big or small. He would do anything for anyone and had an intelligence that he never liked to brag about but everyone knew. John met and married his wife in the late 1960’s after being introduced by Drew Kucera, the principal at Ashland-Greenwood where Bette worked as a music teacher. The couple together had 4 children and 3 step-sons. John built the house that he and Bette lived and raised their children in. John was given the gift to spend his remaining days looking out his living room window to the farm that he loved so dearly. John was a member of the American Legion #129 and the Comet Lodge #229 AF & AM Masonic Lodge. He is survived by wife, Bette Starns; children, Julie (Jeff) Starns Retzlaff of Ashland, Sarah (Chris) Roth of Bennington, Carey (fiancé Lyle Mead) Starns of Omaha, Steven Stanley Starns of Ashland; step-sons, Don (Teri) Marti of Las Vegas, NV, Charlie (Diane) Marti of Lincoln, Geoff (Kay) Marti of Lincoln; his only grandchildren whom he adored Carsyn and Keira Lillian Roth; brother, Del (Grace) Starns of Ashland; sister, Linda (Dave) Luhr of Laurel; many beloved nieces and nephews; and his beloved cat, Buster. He was preceded in death by parents Harland, DDS and Lillian Starns; sister, Sara Sue Morrison. The family would like to recognize Nebraska Medicine, in particular Dr. Nicole Shonka and her team for the care, compassion but most importantly her ability to give John hope and the gift of Time. Thank you to Village Pointe Infusion Staff, pharmacists, lab, and Radiation Oncology who always made John feel special and gave him the best care the family could have asked for. John enjoyed seeing each and every one of them. A special thank you to the staff at Oxbow for their care during dad’s stay and the staff at St. Croix Hospice who helped make his transition peaceful for him and his family. You have my deepest sympathies in your loss of John, and you’ll continue to be in my thoughts. So sorry for your loss, My prayers for your family at this time and God Bless each of you to find Comfort in the Lord.